We’ve done a few of these frequently asked questions blog posts before and we thought it would be a good time to do another. This time we are going to focus on the LW Measurements, also known as Tree Scales, LCT counting scales. As we’ve said in the past, the internet is great for a lot of things but when it comes to purchasing scales, you need to know the correct answers to your buying questions, before you make the purchase. The Tree LCT “large counting scale” is a popular digital scale that many folks have purchased from us over the years. In this article, we would like to answer some of the most popular questions that we get regarding this digital parts counter. And, yes there may be some overlap between questions but each one is a question that has been asked. We’ll also answer a few questions about our thoughts & experiences as well as LCT scale alternatives. So let’s get started! Right off the bat I want to mention that this is a very good choice for customers looking to spend around $200 for a counting scale. The scale is fairly easy to use and the battery life is very long and rarely needs charging. The scale is available in several different choices of capacity and the weighing platter is really large for a scale in this price range. Now let’s get to your most popular questions about the LCT counting scales. What capacities are available for the LCT counting scale? How do I know which capacity scale I need? This is a question we get all the time and it’s a little tricky to answer because not everyone is counting the same items. Basically, you want to buy the lightest capacity that you can. For example, if you are counting light weight resistors or plastic O rings, you do not want to buy the 110 pound capacity counting scale. You would be much happier with a 16 lb capacity scale or lower. On the other hand if you’re counting bolts, then a 66 lb or 110 lb scale would work ok for you. Is this scale accurate enough to count really lightweight things like sheets of paper? Yes the LCT scale can do this. We have sold these scales for counting tokens, tickets, sheets of paper and much more. As we mentioned above, you need to choose the lightest capacity that you can for the best results. Does the LCT scale have battery power? Yes the LCT counting scale comes with a rechargeable battery inside. The battery used to be a sealed lead acid battery. The newest versions of the LCT scale include a lithium ion battery instead. Do I need to calibrate the scale? The scales are shipped to you already calibrated so you should not need to do that. Once you have the scale up and running, it might be a good idea to have the scale calibrated once or twice a year by a scale company with actual real test weights. Does the LCT counting scale have a battery charger? Yes the scale includes the AC adapter / battery charger cord. How big is the platter of the LCT counting scale? Would this scale work good for counting tickets or pulltabs? Yes but choose the capacity correctly. We have sold these to numerous printer type businesses like printshops. The LCT scale can count tickets, business cards, greeting cards, and invitations. The only caveat is that the items you are counting need to weigh the same thing. How does the LCT counting scale work? The total weight will be displayed on the scale. and press the “Sample Unit” key. Press “CE” to return to normal operation. The LCT can count parts but can it do anything else? user of any counting error in case of a low sample size or weight. key in a sample size on the numeric keypad and press “sample unit”. now based on larger population size. the indicator turns on, but counting error might occur. is designed for packing and other applications. Do you have the user manual for the LCT counting scale? I see counting scales online for $100 and I see counting scales for well over $1000, what should I buy? Over the years we have worked with customers who have purchased quite a few counting scales for their business. Some chose to buy scales like the LCT series and some chose to buy more expensive scales like the Pennsylvania 7600. The upfront costs were substantially less for the customers who chose the LCT. However, in the long run the Pennsylvania counting scale seemed to last longer. There really is no one right answer. You want to purchase scales that are good quality, easy to use, and accurate. That is the most important thing. And make sure you train your employees on the right way to use the scale. What can I do to improve my accuracy of parts counting on my LCT counting scales? Use a good sample size. One of the mistakes that we see customers making is allowing their employees to use various sample sizes. If you have one employee who figures out all he has to do is throw 3 pieces on the scale and then you have another employee who counts out 10 or 25 pieces, the average piece weights that these two employees are working with are likely to be different. Do you recommend the LCT scale or something else? If you are looking to purchase a counting scale and your maximum budget is around $200 then, yes the LCT counting scales will work well for you. Based on our experience, this is a well built scale for that price range. With that being said, don’t expect this scale to be up to the standards of higher priced scales like the Rice Lake Counterpart or Avery Weigh-Tronix ZK830 for example. 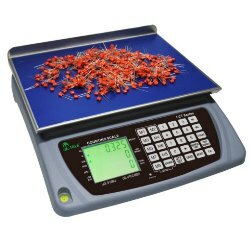 If you wanted something similar to the LCT series but a little more durable and higher quality, then we would suggest the Pennsylvania 7600 counting scale which is made in America.